A step towards building a sense of belonging and provides social support to single adult residents with a history of chronic homelessness. We aim to promote community interactions by improving engagement levels at community events and building a social activity platform to further strengthen relationships among residents. As a human, we all crave for sense of belonging. Research shows that a strong social relationship can affect mental health, physical health, and mortality. Being part of a community provides social support to get through the stresses of daily life, creates empathy for others, and forges a shared identity. The challenge of building community at Harrison Hotel is first recognizing that individual residents are at various stages in their lives and have different communication needs. There is a spectrum of experience in terms of personal trauma, physical and/or mental health, substance abuse, and familiarity/comfort with communal housing. Our aim is to respect individual needs for space and healing, while also building a community of support for all residents. Harrison Hotel is an affordable housing community in Oakland, California, that provides housing for single adult residents with a history of chronic homelessness. Lifelong Supportive Housing Program (SHP) partners with Harrison Hotel housing owners and property managers to support residents in health and social services, housing stability, employment, outreach and engagement. Together, Lifelong and Harrison Hotel are dedicated to improving the overall quality of life of residents by working to build a community that values diversity, compassion, and non-judgment. Team Reach focused on innovating and refining communication systems at Harrison Hotel. Through appreciative inquiry and generative research methods, we interviewed 28 MEMBERS OF HARRISON HOTEL AND RESIDENTS to gain a better sense of their feelings, needs, and motivations as they relate to current communication systems at Harrison Hotel. We also hosted a larger group activity with residents called a Monthly Lunch and Learn to gather feedback on our social activity platform prototype. Then we interviewed 10 staff members and 18 residents. These one-on-one conversations helped us gain a better understanding of their point of view and experiences living and working at HH, which we’ll dive into later. We gave the residents a kit, where in they could express their emotions by playing with emoticons. placements. Shared cookies along with drawing material where in they had to draw a day in their life. We also provided them with disposable camera where in they had been asked to click things which they liked or disliked in context with Harrison Hotel. To have a clear understanding of these design opportunities, we started with field visits -- our fly on the wall observations. We studied the floor plan of HH to figure out the highest traffic areas for interaction. We also , attended Lifelong and HH staff meetings to learn about the HH ecosystem, and how staff and residents interact with each other. we saw an opportunity to build a sense of community centered around open communication and need finding. But before we get into that, let us introduce to you each party’s perspective first. In the current situation, they complained about a lot of residents doing hard drugs, and a lot of them dealing with different kinds of mental illnesses. In addition to that, residents now consider Harrison Hotel as a shelter more than a home. They don’t interact with their neighbours and there is no sense of community in the building whatsoever. They want to create partnerships with artists, students, restaurants, and organizations. They want their partners to come in Harrison Hotel and share their skills or knowledge or whatever they could offer to the residents. Therefore they believe that this will create strong connections with the world outside of Harrison Hotel. They want the staff to ask them personally how they feel or if they need anything. They want more human contact, which they think is lacking in the current situation. A lot of the residents at Harrison Hotel have never been out of Oakland. Wharf, or the Golden Gate Bridge, or the Golden Gate Park. They want to go on short walk in Oakland to some restaurants that offer them good food, or new food they never tried before. They want to go to the movies to watch recently released movies and eat popcorn. There is a gap in understanding between what residents want for community activities and what staff believes that residents want. Before bringing in the outside community, the focus should be on creating a forum for open communication inside Harrison Hotel to better understand residents’ feelings and needs. Creating a stronger communication system could help build trust, accountability, and a sense of community in the longer term. How might we build the sense of community at Harrison Hotel by encouraging everyone to participate and cater to the needs of each resident? 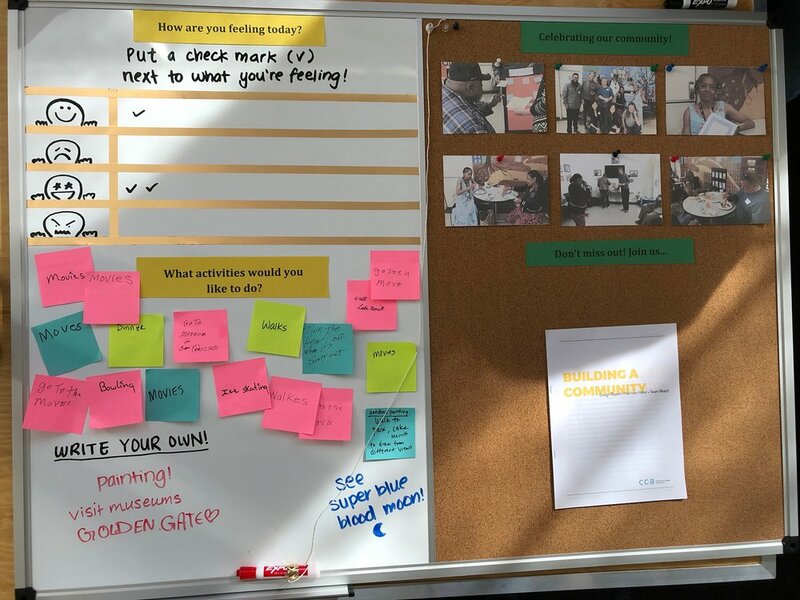 Check-in Question featuring prompts that ask residents how they’re currently feeling and emotion stickers and/or other tools to interact with the board. Activities Wish List and Drop-off Box to enable residents to indicate what activities they would like to participate in and see others’ ideas. There will also be a drop-off box to collect individual replies to longer questionnaires or for privacy. Community Celebration Section that could display photos from past community events and feature the photo/bio of a resident and staff member of the month. Upcoming Events will display information about the next community event, how to get involved, and and other information from the greater Bay Area community. Through multiple meetings and interviews with staff and residents, we’ve gained a better understanding of community needs and built a starting point for communication. The social activity platform aims to engage residents and encourage them to express their needs and wishes. The platform is designed to give residents an opportunity to have their voice heard, while also celebrating the existing community and promoting future participation. We hope that with continuous outreach and engagement, residents will feel encouraged to contribute their ideas, participate in more events, and build a sense of belonging within the Harrison Hotel community.